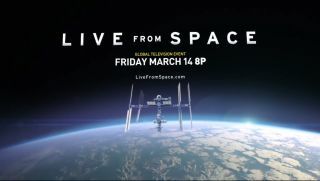 "Live from Space" is an unprecedented TV event on March 14 launching on the National Geographic Channel. The two-hour live program, in partnership with NASA, will connect viewers with astronauts on the International Space Station like never before. National Geographic is about to take one giant leap for cable kind tonight with "Live From Space," unprecedented TV event to share the wonder —and drama — of space travel like never before. The exploration-themed cable channel teamed up with NASA and Arrow Media to create the two-hour "Live From Space" event airing at 8 p.m. ET/5 p.m. PT tonight (March 14) that aims to connect viewers with astronauts on the International Space Station. O'Brien will host "Live From Space" from NASA's Mission Control Center at the Johnson Space Center in Houston. NASA astronaut Mike Massimino will serve as a co-host while astronauts on the space station — American Rick Mastracchio and Koichi Wakata of Japan — will discuss their daily lives, work and risks with O'Brien. They'll discuss space food, space bathroom breaks and even the dangers of spacewalks, O'Brien said. The astronauts will also take questions from the public via Twitter (#livefromspace) and Instagram (#HellofromEarth). Viewers will be able to follow the space station's progress online with the Live From Space website (livefromspace.com), which will offer details of the countries the station is flying over in real-time. "The video is just phenomenal the quality is so amazing," O'Brien said. "I think it'll be really a time that people can be inspired by what's happening literally right above their heads." While NASA has beamed live video from space to Earth before (NASA has its own NASA TV channel), "Live From Space" will make space station history. The program promises to be unlike anything the U.S. space agency has attempted in its more than 50 years of human spaceflight. Created by Arrow Media, "Live From Space" will air in 170 different countries and be simulcast on the Spanish-language Nat Geo Mundo, as well as on the U.K. Channel 4. The International Space Station is the largest manmade structure in space. From end to end, it spans the length of a football field and it can easily be seen from the Earth by the unaided by stargazers who know when and where to look. "From a television perspective, it's very difficult to build a show around that. We'll have to treat it like a somewhat like a breaking news event," explained executive producer Al Berman with Arrow Media. "But NASA has opened their arms wide. This is a first-of-its kind broadcast." Today, in addition to Mastracchio and Wakata, Russian cosmonaut Mikhail Tyurin is living aboard the station. But rotating crews of international astronauts cosmonauts have lived on the station since 2000. Construction of the $100 billion outpost began in 1998, with 15 countries represented by five space agencies building the outpost. "For two hours this Friday, NASA and National Geographic Channel will provide viewers with a live look behind the scenes, both aboard the orbiting complex and with the ground team at Mission Control that watches over the crew and station systems 24 hours a day, 365 days a year," NASA officials said in a statement." Wakata, who is the station's first Japanese commander and leads the Expedition 39 crew, "will give National Geographic Channel viewers a guided tour of the space station, which has more livable room than a conventional six-bedroom house," NASA officials added. That may sound like a relatively straightforward feat, butNASA had to welcome the National Geographic Channel into its inner workings more closely than any other space media project to date. "It is true that it is unprecedented," former NASA astronaut Ron Garan said of the project. "I've never seen any kind of access like this before. Typically live events from space run 15 minutes, 20 tops. Two hours is just unbelievable." Garan is a veteran of two spaceflights, one on NASA's space shuttle Discovery and the other on the station itself. Sharing the joy of spaceflight, as well as the wonder and fragility of our own planet Earth, was one of his goals during his missions, he said. Program planners also had to work with NASA on emergency plans in the extremely unlikely chance of a space disaster like that portrayed in the Oscar-winning space film "Gravity". "We have an emergency plan if there is a disaster aboard the [space station], what do we do?," Berman said (he's not telling). "That's all been worked out with NASA. We have to assume and be prepared for the worst of the worst. Berman said "Live From Space" has also pre-recorded a series of vignettes about the wonders and dangers of spaceflight. They include glimpses into the perils posed by space junk and the unceasing need for astronauts to exercise two hours a day just maintain their strength to return to Earth. One particular piece centers on the harrowing near-drowning of Italian astronaut Luca Parmitano, who experienced a water leak inside his spacesuit while taking a spacewalk outside the space station last summer. During the scary water leak, nearly two liters of water leaked into Parmitano's helmet as he and his crewmate, NASA's Chris Cassidy, worked outside the station. Water covered Parmitano's nose, eyes and ears as NASA called off the spacewalk and ordered the astronauts back inside. "It's the most dangerous place a human being can be, to be in space," Berman said. "That drama is why we're doing all this, as well as it being visually spectacular." O'Brien, like Berman, added that she hopes "Live From Space" can help inspire today's youth in science, as well as the adult viewers. "I think it's very fascinating," she added. "My children, who never get to stay up late to watch television, get to stay up late because they know that they can tweet and send Instagrams to the astronauts, and ask them questions while they're doing the broadcast. And that's phenomenal." "Live from Space" will air in 170 different countries at 8 p.m. EDT/5 p.m. EDT (0000 March 15 GMT). Check your local listings for details.